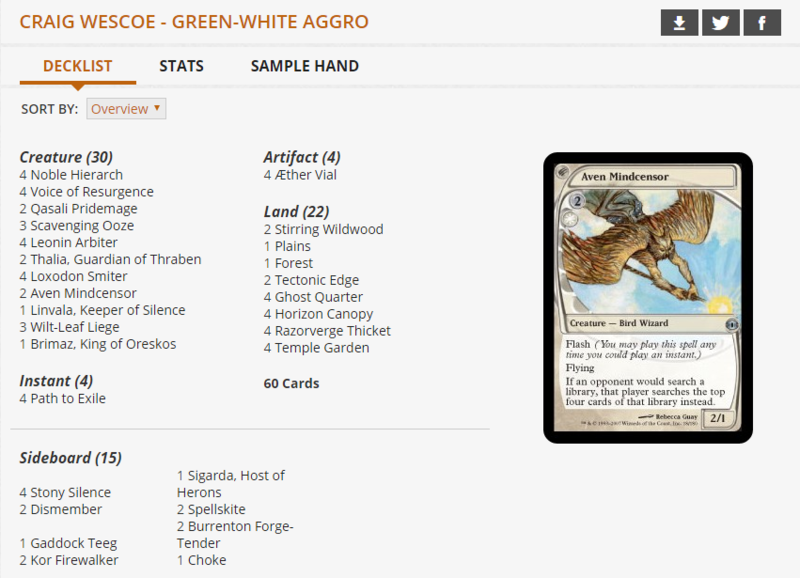 Ben Stark broke up a generally two-deck format (Mardu Vehicles and Saheeli Rai combo) with a rogue Jund aggro deck. His Jund deck, reminiscent of one from the Top 8 of Pro Tour Aether Revolt, adds red for Unlicensed Disintegration only. This week Patrick Sullivan joins us to discuss the one Basic Mountain in Ben Stark's GPNJ Top 8 list (and many other topics)! Unlicenced Disintegration only. Yeah – it’s that good. Otherwise Ben’s deck is a B/G Energy deck. He played Greenbelt Rampager and Longtusk Cub as fast and energy-rich threat creatures. Per usual Winding Constrictor combined with both +1/+1 counters and energy counters for wide and dramatic impact. Surprising, maybe, was that Ben’s deck played only two copies of Verdurous Gearhulk. This was a deck that was not particularly interested in going toe-to-toe with conventional B/G decks. Not only was it likely out-Gearhulk’d, but its sideboard grinding options like Gonti, Lord of Luxury just bring it to main deck par with versions like Brad Nelson’s. Instead it has the one basic Mountain. Given that one card is the defining “difference that makes the difference” that makes this deck, finding it is pretty important. Yes, Ben’s deck does play Aether Hub. Not only does that land tap for red in a pinch, you can easily imagine catching someone with Unlicensed Disintegration out of nowhere. However the basic Mountain is an important source of red. 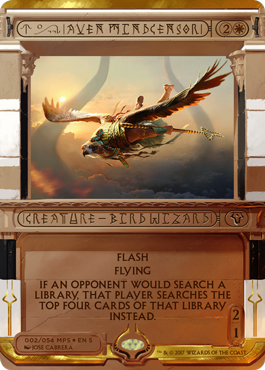 Ben could find it with one of four Attune with Aethers or three Evolving Wilds. Mike suggests that perhaps only one Hissing Quagmire (versus the two Ben played) is correct, in deference to a fourth Evolving Wilds. Who better to guest star in an episode focused on mana bases than @basicmountain himself, Rainmaker Patrick Sullivan? 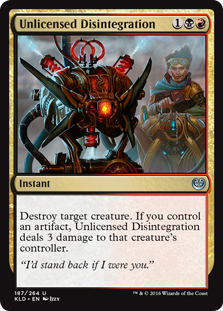 Unlicensed Disintegration is one of the defining cards of the current Standard… And is probably too good. Unlicensed Disintegration is an odd one. “Orzhov” decks will splash red for it. 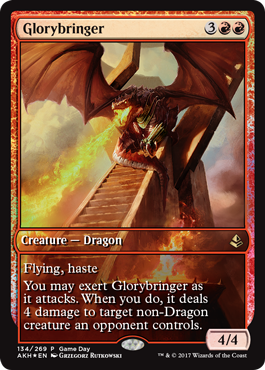 Seemingly two-color red-green decks will go Jund for it. Why? 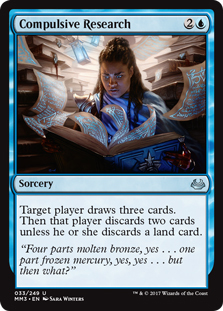 At least in the context of Standard, it’s just too good. Compare Unlicensed Disintegration and Murder. Both are three mana. Both destroy a creature at instant speed. Theoretically the different color on Unlicensed Disintegration is a disincentive (though one you get paid a lot for). The crazy thing is that Unlicensed Disintegration can actually be easier to play than the one-color Murder in many decks! Artifacts or no, it can just be smoother than finding a second black mana. Of course the presence of artifacts goes a long way with this card. Unlicensed Disintegration takes a better-than-fringe playable card (Murder) and tacks a “Lava Spike cantrip” to it. The ask of having an artifact in play is so trivial for the dominating Mardu decks. Their Thraben Inspector gives you artifacts. Their Heart of Kiran is an artifact! 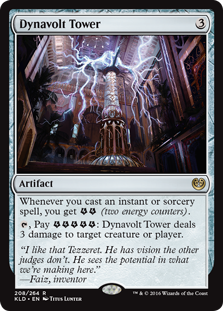 It’s even cool for Grixis decks to play just Torrential Gearhulk as an artifact (to again enable Unlicensed Disintegration). Will it get banned on Monday? Patrick sure hopes so! Our intrepid duo talk not only Unlicensed Disintegration the card, but compare the two main schools of Mardu. … And then go in a completely different direction! Patrick's UR Improvise deck. We discuss it and more in this week's podcast. “Unlicensed Disintegration & U/R Improvise” is a Standard cheat sheet. If you are looking to grok Standard prior to Monday’s changes, look — rather, listen — no further. Ad Nauseam is the centerpiece of a powerful Modern combo deck. The core combination here is namesake Ad Nauseam + Angel’s Grace. While Under Angel’s Grace you cannot lose the game. So… You can’t accidentally kill yourself. Yay! An alternate to Angel’s Grace is Phyrexian Unlife. 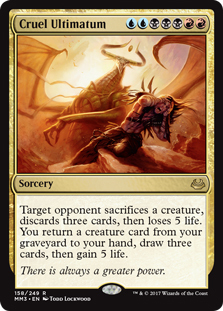 Because the card Ad Nauseam uses your life total for fuel, Phyrexian Unlife [further] protects you by protecting you from the opponent. Playing against Phyrexian Unlife can be challenging for the unfamiliar. If you are at 1 life, it at some level doesn’t matter if the opponent attacks with one creature with one power or one hundred creatures with one hundred power each. 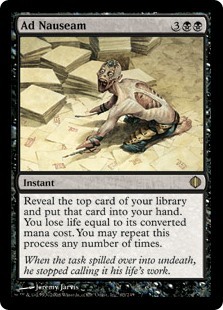 A single combat will not “overload” the Phyrexian Unlife. None of the damage from a single attack will start dealing infect. This strategy might not be the deck you want to play when Infect is popular… But Infect is less popular than it has been in months: Opportunity! This kind of positioning, combined with the raw power and potential speed of the combo itself, are what made Ad Nauseam such a great choice for last weekend. 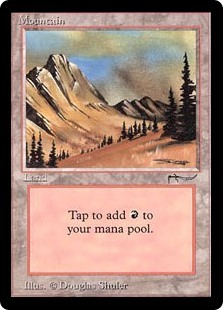 All that said, this archetype’s sideboard options may be what really set it apart. With four — count ’em, four — copies of Leyline of Sanctity (plus a Timely Reinforcements), it is well prepared for the popular (and performing) Lava Spike decks. I had to do a double take on Darkness. Yep, that Legends instant was in fact reprinted in Time Spiral. Much as regular old Fog can buy Mono-Green Tron tons of setup time, Darkness can effectively undo all the effort an opponent put in to Empty the Warrens, Death’s Shadow, or Cranial Plating. Compulsive ResearchCompulsive Research is near and dear to Mike’s heart. He has both filled his own graveyard with Firemane Angels and forced opposing Firemane Angel decks to draw a lethal number of cards. This is a card that allows you to access every part of the veritable buffalo. Cruel UltimatumWe all know what a soft spot Patrick has for Grixis. 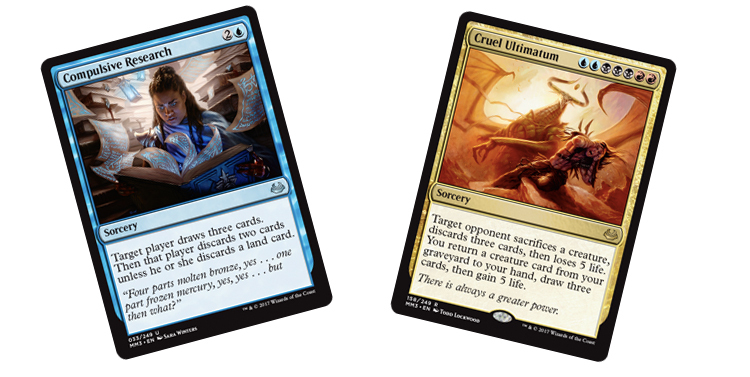 There is no more “Grixis” card than Cruel Ultimatum.